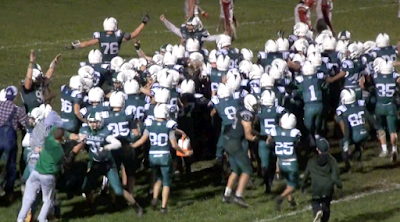 Billerica has had a lot to celebrate this year, but the Indians must now prepare for a huge test against Tewksbury. Ed. Note- Our Mass football guru John Sarianides is back to offer his biggest takeaways from a wild weekend of high school football across the Commonwealth. 1. I think it's safe to say the St. John's Prep is getting better after Saturday's impressive win over BC High. Brian St. Pierre's Eagles are growing up and playing good football at the right time. The Eagles will face another stiff test this weekend when Bridgewater-Raynham visits on Saturday. 2. King Philip had an impressive road win on Friday night against Attleboro and can clinch the Hockomock Kelley-Rex division, and lock up the number one seed in Division 1A South with a win against a much improved Taunton team on Friday night. 3. Haverhill has people's attention after beating Central Catholic and now Andover. The Hillies are legit and they'll be a player in D1 North when the playoffs start. 4. Wachusett proved on Saturday that physicality and running the football still wins football games. It's a tasty recipe. 5. Billerica and Tewksbury both had easy wins this past weekend ahead of their showdown this Saturday. The game will go a long way in determining seeding in Division 2 North. 6. Leominster's 28-26 come from behind win over Shepherd Hill on Friday night proves that the Blue Devils are still a force to be reckoned with in Central Mass. 7. With Milton and Wellesley both winning big this past weekend, it sets up an all or nothing showdown for the Herget Division title on Friday night in Milton. 8. Make it 14 in a row for Dartmouth after their win over New Bedford Friday. The Indians continue to make their case to be in the conversation as one of the best teams in the state. 9. Duxbury rolled again, this time beating Quincy 52-7. The Dragons have Hingham on tap this weekend. If they win, they lock up the number one seed in the highly competitive D2 South bracket. 10. There are several 6-0 teams that could make some noise when the playoffs roll around. Hanover, Falmouth, Wellesley and Marblehead all have enough talent to make a run in their respective divisions. It'll be interesting to see who they draw in the opening round.